Have you heard about the latest trend “day trips” for your next vacation? Many guests are talking about it and as we approach our version of fall and winter, many guests ask, “What do you do when it starts to “cool” off? I love the smell of nature, whether it be the ocean, the river or fresh flowers. If you love the outdoors, I highly recommend a day trip to the Ravine Gardens – a state park located in Palatka, a short 40 minute drive from Beacher’s Lodge. On the way to Ravine Gardens you will notice that you are heading toward the country. This is something most vacationers don’t think about when they think of Florida, but we do have a country side to our beautiful state. The best part of going this time of year is that the weather is cooler and you still see some of the flowers in full bloom. I went once in January and flowers were still in bloom and the weather was perfect. There is an Azalea festival the first weekend in March which is really breathtaking. Upon driving up you will see an aisle of fountains and they are beautiful to see. You will often see children running back and forth, getting rid of all their energy. I just love the layout of the stones and listening to the fountains. There are gardens around these fountains with different flowers attracting butterflies from near and far. 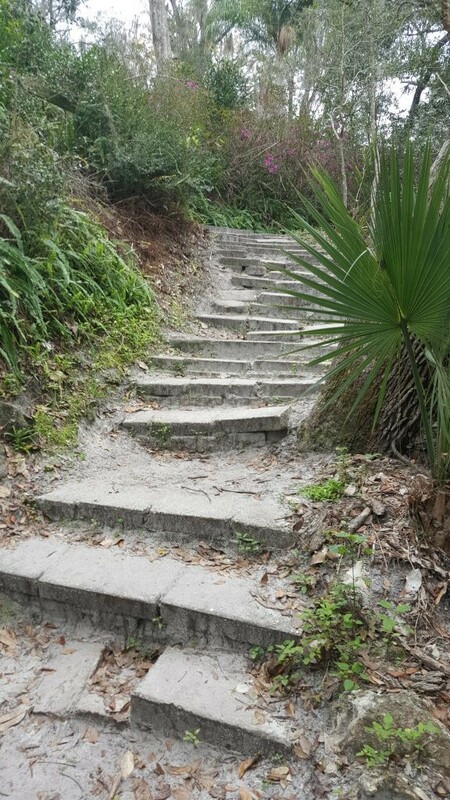 Once you have had your fill of the flowers and fountains, get ready for some hiking, Florida style. Hiking boots are not required unless you plan on running down the side of the ravine which I have seen some kids do. But no matter how careful you are, or how well made your hiking boots are, you still take a risk of getting hurt as the terrain does slope down into a ravine. I personally wear my flip flops, shorts and a t-shirt for comfort. Remember it’s still Florida, so be sure to pack plenty of water! There are restrooms near the fountains, so go ahead and stay well hydrated. One of my favorite spots, which is the same for many of the folks that come here, is of course the swinging bridge. It doesn’t really swing like you might think, but I would still use caution as you cross it. Occasionally you will see some adventurers bouncing on the bridge trying to scare others, but not very often as the area is highly patrolled by our local park rangers and they will get you for misbehaving. Be careful when going up the steps to various trails as they are uneven but so much fun to climb!!! However, I wouldn’t recommend running up or down them as they are not even. They do give you a sense of “yesterday’s past” with their worn appearance. One of my favorite sections of the gardens is a massive area that is full of bamboo. My last trip I was faced with what looks like a giant foot was placed in the middle of all this bamboo. Many of us were mesmerized by it. If you are a big fan of flowers you will love the blooming azalea bushes. The Ravine Garden is full of them!!!! I can never get enough of them and the pleasant fragrances of all the botanicals in this park. If you want to make your adventure complete, I highly recommend packing a picnic and either eating by the stream or at the picnic tables that are located by the fountains. Either way, you will enjoy the soothing sounds of the park and the beauty that surrounds it all. 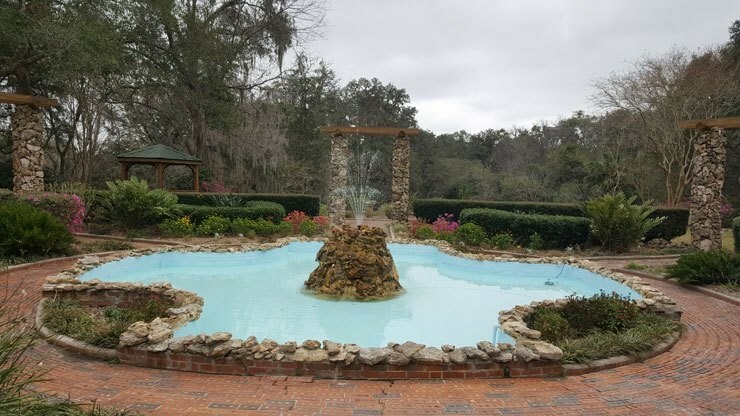 To get to the Ravine Gardens 1600 Twigg St, Palatka, FL 32177 from the Beacher’s Lodge, head North on A1A and take a left onto 206. You will stay on 206 until it ends at 207 South. You will turn left onto 207, drive through the town of Hastings (Potato capital of Florida) until you come to 17 North. Take a right onto 17 North. Next you will see that you are in a little town called Palatka. It’s pretty vacant these days but a pleasure to drive through. Turn left onto N. 3rd Street and continue onto River Street. Take a left on South 15th Street and a right onto Twigg Street. Go slow as you will miss the sign that signals you to take a left for the state park. Remember the first thing you see will be the line up of fountains. Don’t forget there is so much more to see!!! Are dogs welcome at Ravine Gardens? Donna, yes our dogs love the walk around the Ravine Garden loop and exploring the ravine itself! Thank you for this blog. 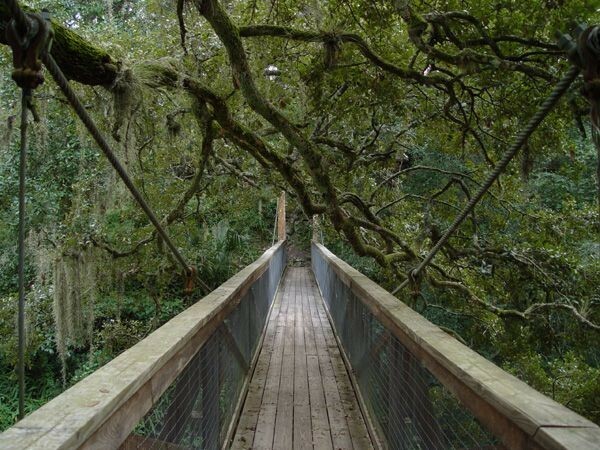 There are so many wonderful day trip destinations from Beacher’s Lodge (Washington Oaks State Park, GTW Preserve, Fort Matanzas NP, etc.) but we have not been to Ravine yet. Next time we come stay with you, for sure! What a wonderfully written article! Thank you for posting this gem and taking me on a brief trip to another of Florida’s natural wonders. 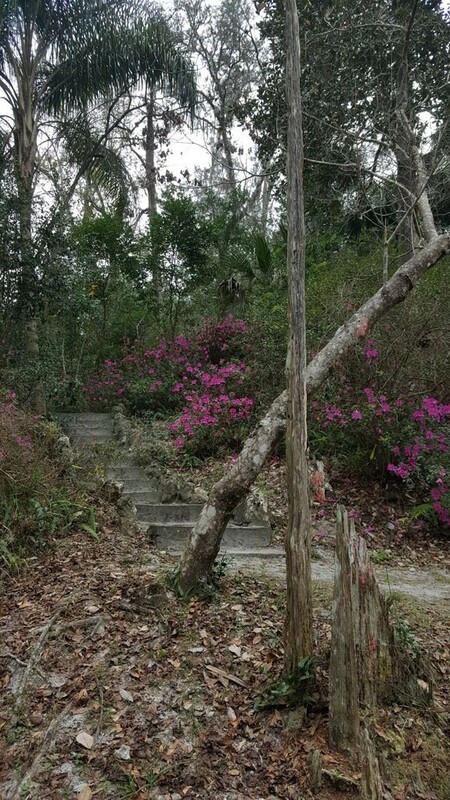 I’ve driven through Palatka many times on the way to my “slice of heaven”, Beacher’s Lodge, and was always curious about Ravine Gardens. Now, I’ll definitely be adding this to my list of must-see places. 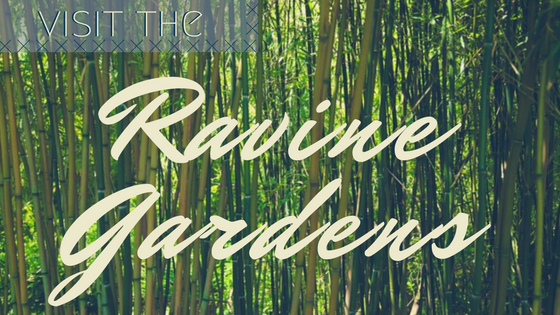 Ravine Gardens have been around for a VERY long time. MANY years ago, over 80 years,they had dances-it is nice to see that this place has -survived. It IS a very special place, for many wonderful reasons. Visit it and know that many people of long ago, fell in love, at this place, as they danced and enjoyed so many wonderful nights. My mother, born in 1916,when she was 16,was escorted to dances there, by her 2 brothers.